From downtown…from Mitch & Murray, Mr. Steak Knives himself, Alec Baldwin, stars alongside with Sir Fava Beans, Anthony Hopkins in The Edge — in this, another David Mamet-penned joint (as talky, though not as memorable as Glengarry Glen Ross). Hopkins plays a polymath billionaire, an almost Victorian era-styled adventurer named Charles, who is accompanying his age-inappropriate wife on a photo-shoot in Alaskan back-country (actually, western Alberta, Canada). Charles, along with his wife’s dashing photographer (Baldwin), and their pal Stephen (Oz/Sons of Anarchy mainstay, Harold Perrineau) find out just how dangerous nature can be right off the bat when a bird strike downs their small plane, after some foreshadowing. Stuck in the remote bush, the trio has to fend for themselves and make it to safety while a mammoth Kodiak bear is in hot pursuit. “You can season meat with gunpowder. Did you know that? With a love triangle as text, not subtext, we know that it’ll take everything these people have to get out of there alive without tearing out each others’ throats before ursa does. When it comes to genre films, 1997 was a pretty great year: LA Confidential, The Fifth Element, Starship Troopers, Donnie Brasco, Jackie Brown, etc. 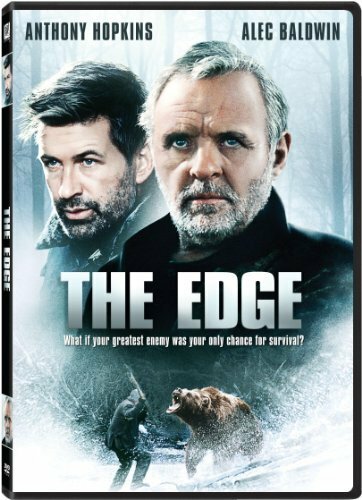 Yet The Edge remains decidedly under the radar, despite a top-drawer cast that also includes Peckinpah regular L.Q. Jones and leggy Down Under model, Elle Macpherson. A genre film with smarts, The Edge loses its namesake with some coda-sagging. Still, a pretty fun nature-run-amok flick, and a great bear to boot. This entry was posted in Action Films and tagged 90s movies, natural horror by Really Awful Movies. Bookmark the permalink.